Call in airstrikes and set explosive traps to hit the enemies where it hurts. Over 20 new levels span the grassiest fields, driest deserts, sparkling cities, and even an infernal volcano lair! Challenge your mind with the exciting new gameplay styles in Puzzle, Sudden Death, and Time Trial levels. Are you ready to stop the fieldrunners once and for all? Join the defense, now! 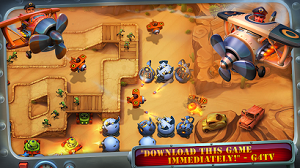 - Pint sized invaders seeking revenge! - A tower that launches bee hives! - Tons of levels in a 20+ hour campaign! 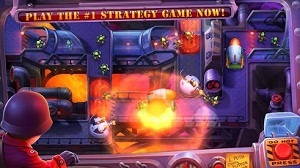 - Revolutionary AI - each enemy creates a dynamic, realistic path through the battlefield! - Gorgeous, hand painted, 2D graphics by award winning artists! - 20 unique, upgradeable weapons! - Custom loadouts let you pick the perfect weapons for each battle! - Air strikes, mines, and powerful items so you can strike with the precision of a surgeon! 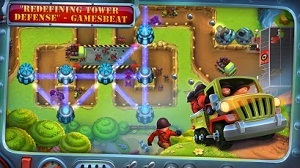 - Time Trial, Sudden Death, and Puzzle maps bring all new challenges to tower defense! - Trenches, bridges, and tunnels add new dimensions to gameplay! 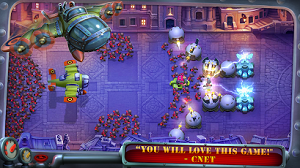 - Collect all the Elite enemies to become the ultimate tower defense champion! - A tower that turns enemies into barnyard animals! Required Android : 2.2 and up.